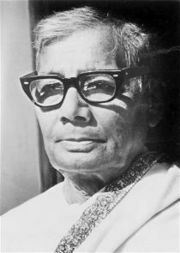 Jasimuddin (full name Jasimuddin Mollah) (1903-1976) was a renowned Bengali poet. He is commonly known in Bangladesh as Polli Kobi, the Rural Poet. Jasimuddin was born in the village of Tambulkhana in Faridpur District. While still a student at university, wrote the poem 'Kabar' (grave), a very simple tone to obtain family-religion and tragedy. Simplicity was his style. That poem was placed in the entrance Bangla book. After obtaining a master's degree in Bangla, he taught at the University of Dhaka. Later, he worked in the information department of the Government.